"Never Been to Spain" is a song written by Hoyt Axton, originally released on his 1971 LP Joy to the World and later that year performed by Three Dog Night, with Cory Wells on lead vocal. It was featured on their 1971 album, Harmony. The song was produced by Richard Podolor. 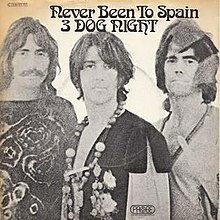 In the US, "Never Been to Spain" peaked at #5 on the Billboard chart, and #18 on the U.S. adult contemporary chart in 1972. Outside of the US, "Never Been to Spain" reached #3 in Canada and #34 in Australia. (1971) "Never Been to Spain"
(1971) "The Family of Man"
The lyrics consist of the narrator ruminating on places that he has never visited, but feels that he has some proxy experience of, via the music or other features of those places, or from having gone to similar locations. In the final verse, he observes that while he has "never been to heaven," he has "been to Oklahoma," where he was told he was born, thus implying a kinship between the two places. Hoyt Axton explained that he originally wrote, "...in Oklahoma, born in a coma...." However, it was considered inappropriate; thus, the lyrics were changed to "not Arizona." Elvis Presley released a version of the song on his 1972 As Recorded at Madison Square Garden. Ronnie Sessions released a version of the song as a single in 1972 that reached #36 on the Billboard Country chart. Cher released a version of the song on her 1972 album, Foxy Lady. Waylon Jennings released a version of the song that was featured on his 1972 album Ladies Love Outlaws and in the 2007 concert film, Never Say Die: The Final Concert and its soundtrack. Ike & Tina Turner released a version of the song on their 1977 album, Delilah's Power. Cravin' Melon released a version of the song on their 1988 EP, Squeeze Me. ApologetiX did a parody of the song entitled "Never Been to Spain (Yet)" that was featured on their 2007 live album, Chosen Ones. The Oklahoma State University Cowboy Marching Band plays a version of the song every football game during the first time out of the fourth quarter, as well as at numerous other events throughout each academic year. It has been recorded in several of their performance albums. The entire marching band and stadium of fans yell "State" in unison following the line "I've never been to heaven, but I've been to Oklahoma". ^ "Hoyt Axton, Singer, Character Actor and Hit Songwriter, Dies". Articles.latimes.com. 1999-10-27. Retrieved 2016-10-04. ^ Associated Press. "Cory Wells, vocalist with Three Dog Night, dies at 74". The Washington Post. Retrieved 24 December 2016.